No Italian seasoning? Use 1 teaspoon dried oregano, 1 teaspoon dried basil and ½ teaspoon garlic powder. 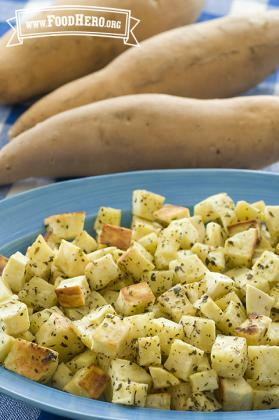 Mix the sweet potato cubes with the oil, salt, sugar, Italian seasoning and pepper so that each piece is coated. Arrange cubes in a single layer on the baking sheet. Bake for 10 minutes, stir or turn cubes, bake an additional 10 minutes or until tender and golden brown.